Case launched Revolution, a company that seeks to drive transformative change by shifting power to consumers, in April 2005. Revolution's mission is to partner with entrepreneurs in building businesses that give people more choice, control and convenience in important areas of their lives such as health, wellness and recreation. Prior to starting Revolution, Case was the chairman and CEO of America Online, Inc., and later, the chairman of AOL Time Warner. He is the man who brought the world the immortal phrase "You've got mail." 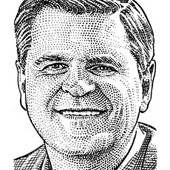 A new fund from Steve Case’s investment firm targeting early-stage startups. Steve Case on tech talent and immigration reform. Revolution Growth, the investment firm from former top AOL execs Steve Case and Ted Leonsis, has closed its biggest investment to date. The fund is betting big on Bigcommerce, an e-commerce software company that helps small businesses set up their own online retail presence, in a $40 million Series C round. Bigcommerce has now raised $75 million. This is just the latest big bet on e-commerce upstarts by Revolution Growth, which recently announced a $20 million-plus investment in Optoro and a similar-sized investment in kids’ clothing maker Lolly Wolly Doodle. Optoro, a Maryland-based startup that helps brick-and-mortar retailers sell their unsold or returned goods on third-party e-commerce marketplaces, has raised a $20-million-plus investment led by Revolution Growth, the investment firm started by former AOL execs Ted Leonsis and Steve Case. The company would not disclose the exact amount of the funding, but a Form D filing indicates that it totaled $23.5 million. About $3 million of the new investment went to current shareholders, according to the filing, and Leonsis is joining the company’s board. Grotech Ventures also invested in the round. Social Radar, the mobile-focused startup that aims to connect users through location-based targeting and social network cross-referencing, announced a $12.75 million Series A round on Wednesday. The round was led by New Enterprise Associates, Grotech Ventures and Swan & Legend Ventures, with participation from Steve Case, Ted Leonsis, Dave Morin, Kevin Colleran, and a number of other angel investors. Dayna Grayson from NEA, Steve Fredrick from Grotech Ventures, Fred Schaufeld from Swan & Legend Venture Partners, and angel investor Kevin Colleran will all join Social Radar’s board of directors. Steve Case’s Revolution Growth has led a $20 million investment in Lolly Wolly Doodle, a North Carolina-based kids’ clothing maker that has built its business on the back of Facebook. The company has developed a huge following on the social network, where it posts images of items — mostly dresses and skirts — and takes online orders in the comments section, only manufacturing each article of clothing after it has determined the demand for it. Founder Brandi Tysinger-Temple explained the concept in a video interview with Kara Swisher last fall. Memo to Tom Peters: Zipcar had a big pop and a long decline, and Benchmark, Greylock and Steve Case stuck around for almost all of it. The bill signed Thursday by President Barack Obama that loosens accounting rules for start-up companies owes much to billionaire Steve Case — whose own company was one of the highfliers of the ’90s dot-com boom but later suffered accounting scandals. Venture capitalists and start-ups converge on Colorado to drum up funding deals (and get a little skiiing in). Ad tech firm Resonate has a simple pitch: It says it can figure out what different groups of Internet users care about, and where to find them on the Web. What Cash Crunch? Revolution Growth Raises $450M for Its First Fund. LivingSocial's Tim O'Shaughnessy About Local Deals and Not Being Groupon! Not sure what stings more: dodgeball being sent to the glue factory or that we were lumped in w/ Google Catalog Search. — Dodgeball co-founder Alex Rainert via Twitter, in reaction to the news that Dodgeball is being shut down.